President Trump was right again with his suspicion that Obama's officials worked to unmask the Trump transition team. 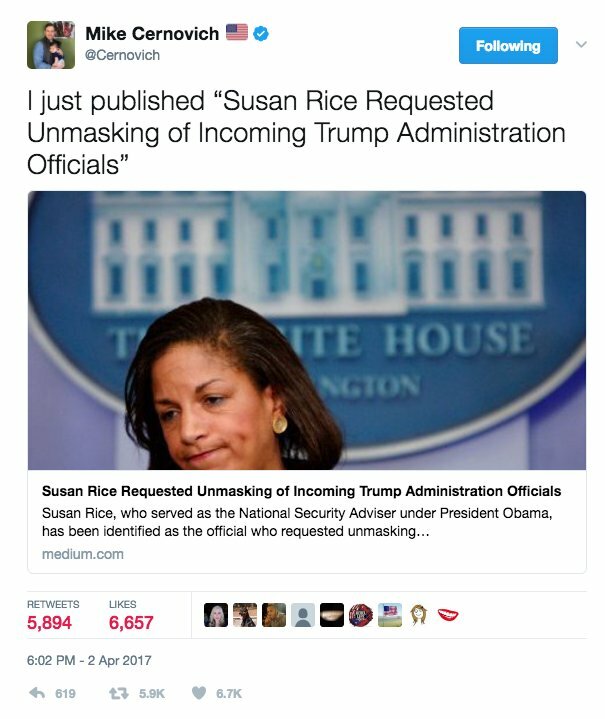 Mike Cernovich from Cernovich Media, was the first to break the news that Susan Rice, former National Security Adviser for President Obama, was the one who requested unmasking of incoming Trump Transition Team. "The White House Counsel’s office identified Rice as the person responsible for the unmasking after examining Rice’s document log requests. The reports Rice requested to see are kept under tightly-controlled conditions. Each person must log her name before being granted access to them. “Unmasking” is the process of identifying individuals whose communications were caught in the dragnet of intelligence gathering. While conducting investigations into terrorism and other related crimes, intelligence analysts incidentally capture conversations about parties not subject to the search warrant. The identities of individuals who are not under investigation are kept confidential, for legal and moral reasons." "As his presidency drew to a close, Barack Obama’s top aides routinely reviewed intelligence reports gleaned from the National Security Agency’s incidental intercepts of Americans abroad, taking advantage of rules their boss relaxed starting in 2011 to help the government better fight terrorism, espionage by foreign enemies and hacking threats"
The Fake News New York Times Maggie Haberman, sat on the story for days. 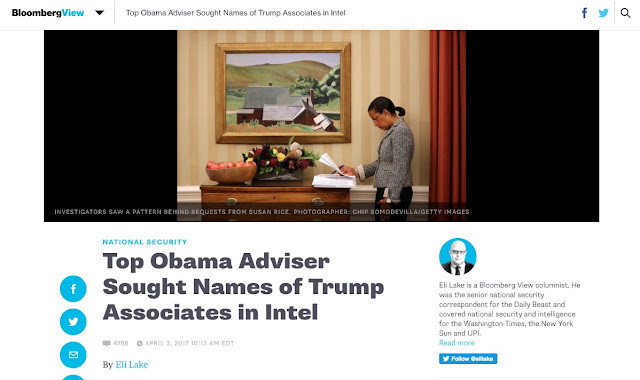 "The Times, WaPo, and other outlets rely on anonymous sources in nearly every article about national security. It’s clear they have an agenda — that agenda is not telling the truth. This reporter has been informed that Maggie Haberman has had this story about Susan Rice for at least 48 hours, and has chosen to sit on it in an effort to protect the reputation of former President Barack Obama." Bloomberg's Eli Lake plagiarized Cernovich’s story, giving no credit to Cernovich. "Amid the turmoil over staff shake-ups, blocked travel bans and the Russia cloud hanging overhead, President Donald Trump is steadily plugging away at a major piece of his agenda: Undoing Obama. From abortion to energy to climate change and personal investments, Trump is keeping his promises in methodically overturning regulations and policies adopted when Barack Obama was president. Trump recently failed to fulfill his pledge to repeal and replace the Affordable Care Act, which continues to stand as Obama’s most recognizable domestic policy achievement. Trump and House Speaker Paul Ryan couldn’t persuade enough fellow Republicans to back new health care legislation last month. Ryan pulled the measure just before a scheduled House vote. Trump has had better outcomes in other areas."